Sports are a pretty intuitive place for augmented reality: we already watch them with a bevy of numerical overlays, replays, and commentary. 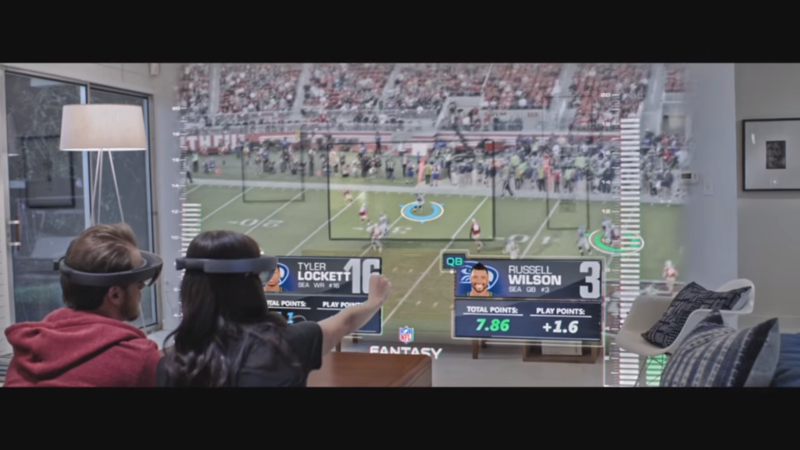 So Microsoft’s “future of football,” featuring its HoloLens headset, unsurprisingly makes a lot of sense. It’s a highlight reel showcasing every possible football-spectatorship-related use of HoloLens, from getting an expanded view of the screen to watching tiny 3D figures enact plays on your coffee table. I’m not sure whether most viewers want life-sized models of players to burst through their walls like the Kool-Aid Man, but then again, I’m not much of a football fan. HoloLens videos have a tendency to oversell what its images actually look like, but most of the uses here are at least theoretically feasible. The field of view, for example, can accommodate a medium-sized coffee table from a reasonable distance. It’s a little harder to buy a wall-sized video screen, but that depends largely on how much space viewers can put between themselves and the wall. THE BIGGER QUESTION: IS THERE ANY NON-AWKWARD WAY TO WEAR HOLOLENS AT A PARTY?